Be Hendrix represents a renewed commitment to the endless promise of a rigorous liberal arts education and to the timeless values – academic excellence, character, community, and opportunity – that have distinguished Hendrix for more than a century. Through Be Hendrix, endowed scholarships will increase to keep a Hendrix education affordable for all students. 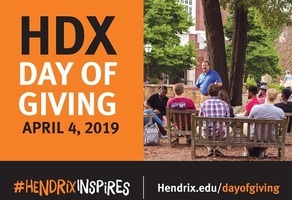 On April 4, 2019, give back to Hendrix to pave a way for the inspirations of students today and tomorrow. Make an impact at Hendrix College! Connect with other Warriors on GiveCampus!